Every new year my thoughts turn to how to reduce lots of things: my weight, my spending, my mess and waste. So this week’s craft helps with at least two of those. Remember Mr.Rabbit? Well I had quite a bit of wool left over from making him so in the spirit of spending less and recycling I thought I’d use some of it this week. And I’ve written a little tutorial for you so you can make one too. 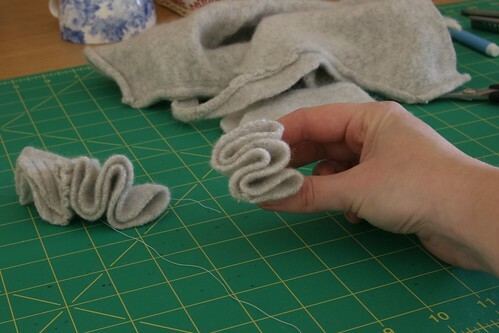 1 ) Cut out six circles from your felted wool (or whatever fabric you have to hand). I used a teacup as the template. 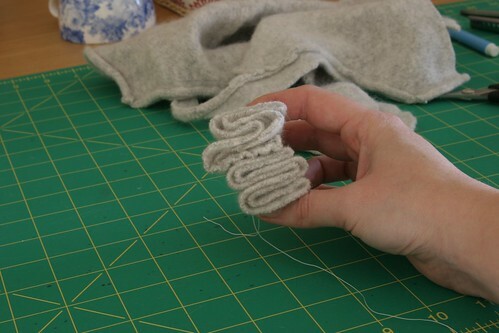 2 ) Thread a needle with a piece of strong white thread and tie a knot in the end. 3 ) Fold one of the circles in half and half again. 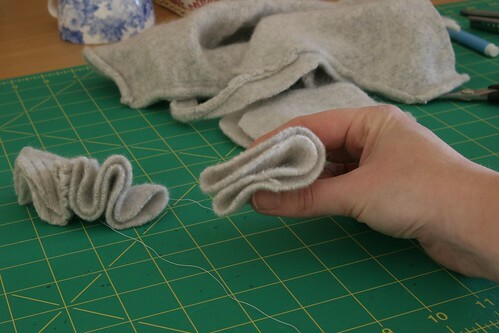 4 ) Then fold each flap out on to itself. Hard to explain this in words so have a look at the photos but leave a comment if you need more explanation. 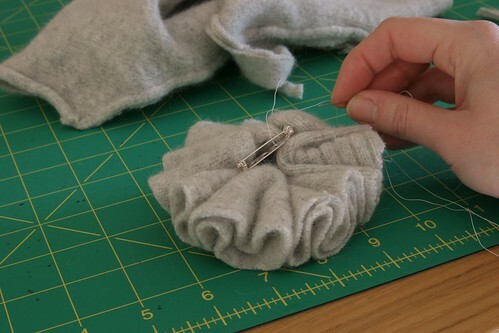 5 ) Pull the needle and thread through all the folds. 6 ) Then fold the next circle. And sew through that too. 7 ) Keep going until you’ve sewn together all six. 8 ) Secure it all with a few stitches until you’re happy with how it looks. 9 ) Attach a brooch bar or safety pin on to the back and you’re all done. Hope 2011 is going well for you so far – happy crafting! other things. I would even add some sparkle . Looks nice and easy! Good for kids. The description you’re looking for is “accordian fold”, to describe that back-and-forth folding. Aha accordian fold! I knew there must be a way of describing it :) Thanks Anita.